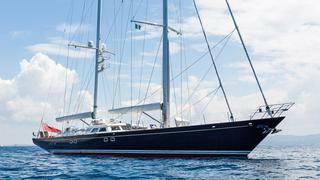 The 36 metre sailing yacht Yanneke Too, jointly listed for sale by Burgess_ _and Yachtzoo, has been sold with Ardell introducing the buyer. Interior design is by Terence Disdale and employs rich, hand-picked cherry wood joinery to create a striking effect. A large bird’s-eye maple and briar table in the main saloon provides dining for four, and can be extended to accommodate eight guests. Accommodation is for six guests in a master suite aft, a double and a twin cabin. All cabins come with Russound multi zone music controllers and en suite shower facilities. A twin masted schooner, she has a pair of Omohundro carbon fibre masts coupled with an in boom furling system by Marten Marine. She was designed with a shallow draft, enabling access to all those sought- after anchorages at sheltered bays and coves. Under sail, her top speed is recorded at 12 knots and under power a single 470hp Lugger engine gives her a cruising range of 3,000 nautical miles at eight knots. Yanneke Too was asking €1.8 million.